Last night the offices and homes of Alliance Party members were attacked and a number of police officers injured in protests. 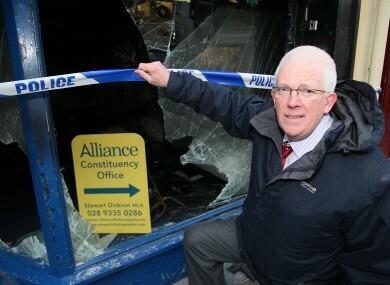 Alliance MLA Stewart Dickson in Carrickfergus, Co Antrim beside his office which was attacked last night. ALLIANCE PARTY LEADER David Ford has said the Northern Ireland Assembly must be recalled to show it is united in its opposition to recent violence in Antrim and Down targeting elected representatives. The attacks on Alliance Party offices and members have come amidst protests by people who are opposed to Belfast City Council’s recent decision to stop flying the union flag every day. The party leader has submitted an urgent motion to the Assembly this morning, following the escalation of attacks last night in which two offices were trashed and and the home of two councillors was attacked. Ford said attacks on any one political party are attacks on democracy itself and the Assembly must unite to show that it will not be accepted. Last night four people were arrested in Carrickfergus after protesters attacked an Alliance Party office and threw bottles and missiles at police. In Bangor, Alliance MLA Stephen Farry confirmed that his constituency office was subject to an attempted arson attack yesterday evening. The attack coincided with another attack on his colleagues, Alliance Party councillors Christine and Michael Bower whose house was pelted with paint bombs last night. Today Labour Youth National Chairperson, Aideen Carberry, said the response to the decision on the flag flying by the more extreme elements of those opposed has been “disgraceful”. “These attacks must be condemned in the strongest way possible by the First Minister, particularly in his role as leader of the largest Unionist party in the Northern Assembly,” she said. She said it is now right that the leaders of unionism condemn those who have brought violence to this debate, which was democratically settled in the chamber of Belfast City Council. Email “Alliance Party calls for Assembly to unite against attacks in Antrim, Down”. Feedback on “Alliance Party calls for Assembly to unite against attacks in Antrim, Down”.